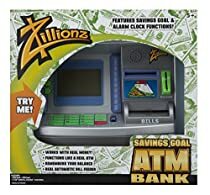 The Zillionz – Savings Goal ATM Bank, 3011006 makes smashing your piggy bank a thing of the past! This ATM machine for kids works as a personal savings bank. Key in your secret PIN number! The large screen welcomes you by name, then gives you all of your up-to-date account information. Its built-in camera and sound effects are so real, you’ll think you just pulled into the bank! This ATM bank requires (3) “AA” batteries that are included with the toy. The 3011006 measures 12-inches by 4-inches by 10-inches. Zillionz is a popular brand of educational products and toys that teach children the value of money and mathematics. Visit www.amazon.com/alex-brands for more information on Alex Brands and our best-selling line of educational and entertaining products for kids.